Krav Maga is a non-competitive self-defence system that focuses on real-world situations. Krav Maga employs principles that emphasize on threat neutralization, simultaneous defensive and offensive techniques and aggression. It has been refined for civilian, police, VIP and military applications. Because there are no sporting rules, individuals trained in Krav Maga are not limited to techniques that avoid severely injuring their opponents, but training and sparring drills are conducted with maximum safety to the students by the use of protective equipment and the use of reasonable force. For example, kicks to the groin are common, but groin protection must be worn by all students at all times. So maybe you have done a search for Krav Maga or self-defence and arrived at our website - now you are wondering, what's so special with this school and why should you join this one? We will answer this below. First of all, we are an OFFICIAL branch of the International Krav Maga Federation (IKMF) based in Netanya, Israel. We have never lost our close tie to the source of Krav Maga. The IKMF approach to Krav Maga has remained the closest to the spirit of the founder Imi Sde-or:We only teach the most practical, simplest solutions to a wide variety of problems and we have never mixed any martial arts into our system, it is an entirely original defence system, very easy to learn and very hard to forget. The IKMF is headed by Master Avi Moyal, one of the most respected Krav Maga Master in the world and one of the founders of IKMF. 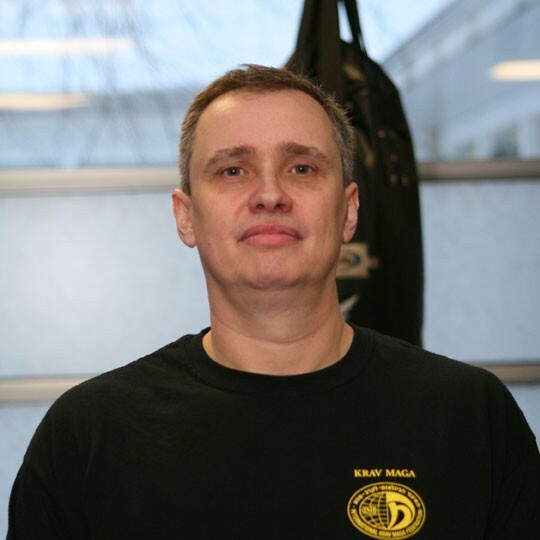 M. Moyal was a direct student of the creator of Krav Maga, Imi Sde-or. All instructors worldwide must train every year with Avi Moyal and/or one of IKMF top experts in order to remain in the federation. IKMF is home to the world's highest level Krav Maga Experts, including Tamir Gilad, Israel Tamir and Israel Cohen. Together they form the Global Instructor Team (GIT) and teach the system, in its purest form, all over the globe. Our own Head Instructor Laurent Mougeot is a member of the Global Team and one of the world's top Instructors! Why choose us for your self-defence needs? Because we are the best if you want to learn Authentic Krav Maga, as it was intended to be taught. So that you can defend yourself in real life situations even if it is against multiple opponents with weapons. You need more reasons? We do not enter you into any long term contract to trap you: it's very easy, you pay $140 monthly, $325 for 3 months, $600 for 6 months or $1100 for a year! (prices already include HST). In class you will learn a wide variety of techniques and principles EVERY CLASS, you will NOT spend half of the class doing cardio exercises and combatives. We do a 10-15 min. warm up, including review of the previous week's techniques, then it's down to business! We GUARANTY that if you put in the work and come to every class, you will learn at an incredible speed how to effectively defend yourself in a wide range of situations! The atmosphere of the class is informal: we work hard and seriously but we have fun, no macho attitude there. Women are very welcome and Krav Maga is the best approach for women's self-defence! Come try a class for free, no obligation! You can join at any time come and talk to my students to get some feedback! Upon registration all students must purchase one IKMF T-shirt ($20) that they will wear in class. That is $20+ HST = $22.60. After graduating for P1 students will need boxing gloves and shin guards (available in class).